DKSH successfully held a ceremony to mark the opening of its new IT headquarters in Menara KEN TTDI in Kuala Lumpur, boasting a new collaborative working environment equipped with employee-centric technology. 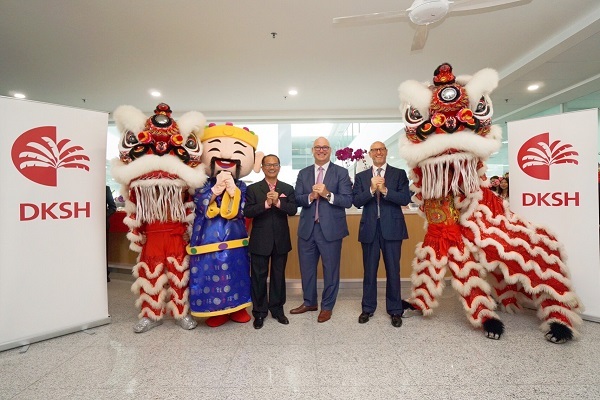 Kuala Lumpur, January 28, 2019 – As the second-largest Swiss-based organization and the only global information technology (IT) center in Malaysia, DKSH held the opening and ribbon-cutting ceremony of its Corporate Shared Services Center (CSSC) at Menara KEN TTDI, after having resided in Teknologi Park Malaysia for 15 years. DKSH CSSC’s award-winning status as a Multimedia Super Corridor (MSC) company highlights DKSH’s mission to meet the evolving needs of its clients and customers as well as to remain the leading Market Expansion Services provider with a focus on Asia. Ever since, the company’s IT department was headquartered in Malaysia, providing leading-edge IT services, consulting and advisory as well as business process outsourcing for finance back office operations to clients around the world. Together with the Swiss Ambassador in Malaysia, H.E. Michael Winzap, more than 50 leaders from multi-national technology companies, such as Microsoft and SAP, among others, gathered for the office inauguration ceremony. They all witnessed the notable moment of DKSH CSSC opening its office doors at Menara KEN TTDI to reveal a modern and attractive work environment. The new workplace accommodates the growing needs of today’s employees by providing a more collaborative working space, flexible work arrangements and state-of-the-art technology, such as Quick Response (QR) scan to check for the availability of meeting rooms, mobile apps, chatbots and radio-frequency identification (RFID) on office access tags. More than 230 specialists work at the new facility. Michael Hutab, Chief Information Officer at DKSH, stated: “We are excited about this significant upgrade of our IT infrastructure, which enables us to serve our business partners even better and to continuously provide cutting-edge services and setting new industry standards for market information access and comparability. As a service provider, people are our greatest asset. We care about our employees – and we believe recruiting and retaining the right talent is the core to our organizational success. We expect to attract the attention of tech-savvy talents and to become the employer of choice." DKSH is the leading Market Expansion Services provider with a focus on Asia. As the term "Market Expansion Services" suggests, DKSH helps other companies and brands to grow their business in new or existing markets. Publicly listed on the SIX Swiss Exchange since 2012, DKSH is a global company headquartered in Zurich. With 825 business locations in 37 countries – 800 of them in Asia – and 31,970 specialized staff, DKSH generated net sales of CHF 11.0 billion in 2017. DKSH was founded in 1865. With strong Swiss heritage, the company has a long tradition of doing business in and with Asia and is deeply rooted in communities and businesses across Asia Pacific.